Hello! 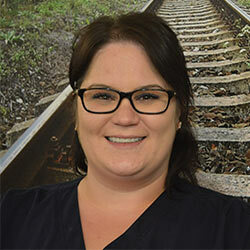 My name is Kirstyn and I’m excited to be part of the team at Orthodontics at Don Mills with Dr. Noble and Dr. Cassolato! I have had the pleasure of working in orthodontics for over 10 years. One of the things I enjoy most about my career is to see how transforming a patient’s smile can change their lives. I love getting to know our patients, asking them about their day, their lives, getting to know them and watching their self-confidence grow with their braces or Invisalign treatment. Having been through orthodontic treatment myself, I can relate to all of the positive and also the challenging aspects of orthodontic treatment. We all know wax is your best friend! Wax on, wax off! But we also know that the end result will have us smiling for the rest of our lives. I look forward to seeing you all at your next orthodontic appointment! I’m so excited to be part of the Orthodontics on Don Mills team. We have a wonderful team of talented, dedicated and hardworking people who work hard to give you an amazing experience and a great result. Thank you for this amazing opportunity to serve and I look forward to seeing your smile!